‘A naked, brownish, black haired creature’, he would run up trees when approached and could utter no intelligible sound. The latest in a long line of feral children – in turn celebrated, shunned and cursed through the ages – ‘The Wild Boy of Hameln’ would be the first to achieve real fame. After a spell in the House of Correction in Celle, the boy was taken to the court of King George I, Duke of Hanover and King of the United Kingdom who was visiting his homeland at Herrenhausen. Here the young curiosity was initially treated as an honoured guest. He was seated at table with the king and dressed in a suit of clothes with a napkin at his neck. However, he repelled his host with his complete lack of manners. He refused bread, but gorged himself on vegetables, fruit and rare meat, greedily grasping at the dishes and eating noisily from his hands, until he was ordered to be taken away. He was given the name of Peter, but was variously known as ‘Wild Peter’, ‘Peter of Hanover’, or, most famously, ‘Peter the Wild Boy’. In the spring of 1726, after briefly escaping back to the forest, Peter was brought to London where his tale had aroused particular interest. As in Hanover, he caused a sensation and his carefree nature provided an amusing antidote to the stultifying boredom and decorum of court life. For some reason there was something about Peter that appealed to Caroline, Princess of Wales, who persuaded the king to allow Peter to move to her residence in the West End, where he was kept virtually as a pet. Though he insisted on sleeping on the floor, he was dressed carefully each morning in a tailor-made suit of green and red. He was also appointed a tutor, who had him baptised and taught him to bow and kiss the hands of the ladies at court. By all accounts this was something of a battle as Peter hated clothes and was literally wrestled into wearing them every day whilst his natural tendency was to pick-pocket and steal from those in the royal court. It must be noted that there is no real reason to assume the boy was actually called Peter, for sadly, Peter was unable to talk. And dy’d a Martyr in her Cause! But Peter could not to live up to the popular interest invested in him and as like today, a fickle public quickly abandoned him in favour of the next unfortunate oddball to appear on the London stage. His academic progress also failed to match his earlier promise. He was declared ‘unable to receive instruction’, despite the attentions of ‘the ablest masters’. He could say nothing beyond his own name and a garbled form of ‘King George’. By 1728, his tutor had given up his efforts and Peter was retired to the country. A home was found for him on a farm near Northchurch in Hertfordshire and a generous crown pension of £35 per annum was supplied for his upkeep. The ‘talk of the town’ became a humble farm hand. This though was much better than could be expected for many such people in Georgian England when they would be packed off to the Freak Show Circus to spend the rest of their natural lives being gawped at and prodded by onlookers. In 1745, the year of the Jacobite Rebellion, he was arrested as a suspected Highlander and, six years later, he wandered east as far as the city of Norwich, where he was thought to be a Spanish subversive. As a result he was fitted with a heavy leather collar bearing the inscription: ‘Peter, the Wild Man of Hanover. Whoever will bring him to Mr Fenn at Berkhamsted, Hertfordshire, shall be paid for their trouble.’ It may look a little inhumane or rather like a collar that a slave might wear but it was not meant to be so and was a kind gesture by the local farmers who though rather fondly of Peter. The inscription on the collar of Peter The Wild Boy, lest he wandered off. Tales of feral children always fascinate, but Peter caused a sensation. It was the Age of Enlightenment, and he became a symbol in the debate about what it meant to be human. People were beginning to question established authority and religion. And they were interested in what distinguishes us from the animals. If he has no speech, does that mean he has no soul? Do human beings really have souls? He raised lots of philosophical questions. Though Peter’s life is remarkable enough, what is most astounding is the sheer scale of scientific and philosophical interest that his case aroused. While wits opined that the boy might be corrupted by the sybaritic life of London high society, others saw in him an ideal test case for the nascent sciences of anthropology and psychology. To the thinkers of the Age of Reason, Peter represented a blank slate. As humanity in its ‘raw’ state, he was what Jean-Jacques Rousseau called ‘the noble savage’, man ‘unspoilt’ by society and civilisation. He was indeed a fascinating subject, but he provoked further, disquieting, enquiry. He was undoubtedly human but, lacking speech and socialisation, could he be classed as a man? Could he have a soul? Could he possess the power of thought? Of the numerous thinkers and writers who addressed the subject, Daniel Defoe did so with the most clarity in his pamphlet Mere Nature Delineated, published in 1726. He described Peter as an ‘object of pity’ but cast doubt on the story of his origins, dismissing it as a ‘Fib’. On the issue of Peter’s soul, he was more charitable. Possessed of the gift of laughter and thought, Peter clearly had a soul, he wrote, but its powers did not yet act within him. He was, in sum, ‘in a state of Mere Nature … a ship without a Rudder’. And it was the task of his tutors to bring him to ‘the Use of his Reason’. He deferred the final verdict on Peter, therefore, until the results of his education became apparent. If he could receive instruction – if he could be taught to heed his soul – then he would become a man. And, what was more, he would be a lesson to us all, especially, wrote Defoe, ‘those who think nobody so wise as themselves’. Defoe wrestled manfully with the uncomfortable question that Peter posed: what was it that divided ‘us’ from ‘them’, man from the animals? Different minds arrived at different conclusions. But the habitual tidier of nature Carl Linnaeus was typical. He reassured mankind by creating a separate species of ‘wild men’ or homo ferens. Peter was still clearly an outsider – one of ‘them’. Peter’s example was later used in numerous theories of child development, socialisation and the role of language. Many thinkers dwelt on his inability to learn to speak. The philosopher James Burnett (Lord Monboddo), whose ideas anticipated some of those of Charles Darwin, presented him as an illustration of his theory of the evolution of language in the human species. He saw Peter as evidence that ‘man was born mute, and that articulation is altogether … a habit acquired by custom and exercise’. To others, Peter was thought to demonstrate the existence of a ‘critical window’ in which language and other skills are developed in the child. Having missed the ‘window’, Peter could never learn such skills again. Hence the apparent failure of his esteemed tutors. Other scientists concentrated on the role of ‘socialisation’ in child development. After a childhood supposedly devoid of parental care and nurture, Peter was considered to have developed a ‘mental indifference’ and a lack of empathy, reflection and memory. In common with other feral children, it was argued, he ‘lived solely to survive’, satisfying only his base desires for food and sleep. In other interpretations, Peter’s mental shortcomings were attributed primarily to his lack of language. Having never learned to speak, it was suggested, how could he comprehend his own ‘inner voice’? How could he order and make sense of his world? The result was that he was virtually unable to display higher mental functions. He was trapped in the mind of a toddler. Rather than being a genuine ‘feral child’ then, Peter was most likely abandoned by his parents who were unable to cope with his behaviour and impairments. 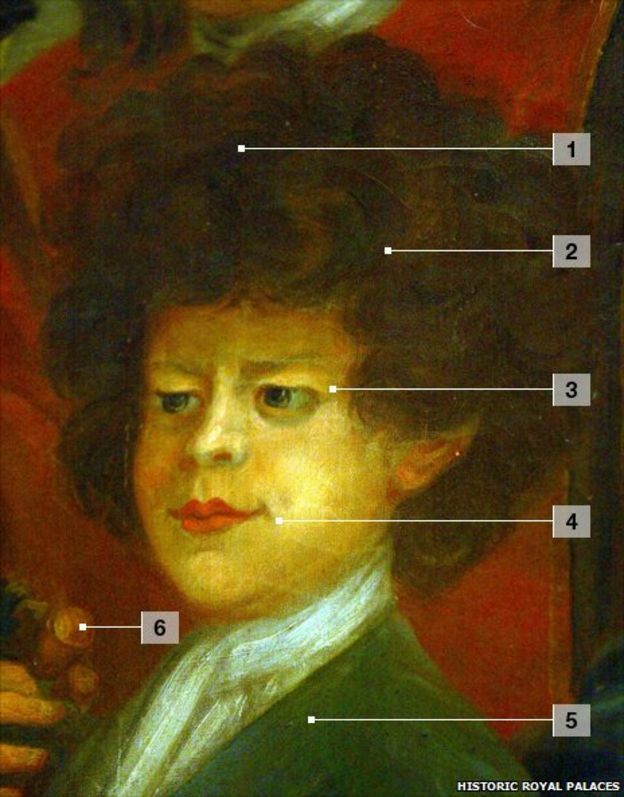 Though sent to the country, Peter was recorded as a small part of a very grand painting which can be found in Kensington Palace. It is no surprise then that contemporary physicians wrote Peter off as being ‘Wild’, even today there have only been 150 recorded cases of Pitt-Hopkins Syndrome across the globe. Whatever his ailments, Peter was not forgotten by the royal court. His keep was paid by the crown for nearly 60 years through three reigns and when he died a brass tablet was erected to his memory at royal expense. He was given a prime spot in the graveyard at Northchurch, which is only about 8 miles from where I live. 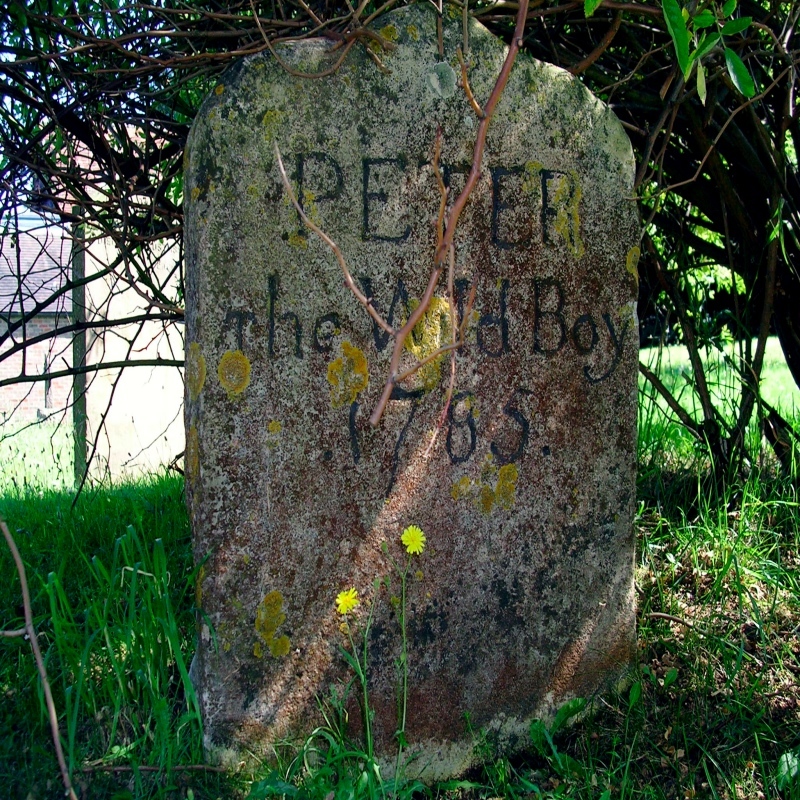 Close to the south porch his rough-hewn stone, now shaded by an unruly dog rose, reads simply: ‘Peter the Wild Boy – 1785’. The stone was paid for by the locals and even today flowers can often be found on his grave. Despite his moniker, Peter was never reported as being aggressive or hurting anyone and whatever the philosophical debates of the time, it seems he was a gentle, happy if very unusual human being. This entry was posted in history, Life and tagged Berkhamsted, County of Hertfordshire, Hannover, history, King George, Northchurch, Peter The Wild Boy, royalty. Bookmark the permalink. Yes, it is an interesting comparison isn’t it. Absolutely fascinating! I hope he was happy in his wildness in England. Excellent post. Thanks Cathy. I hope he was too. I guess if he lived such a long life and the locals cared for him, he must have been happy in his own way. I’m amazed that he lived to be 70. That would have been quite old back then. Yes, I’m pretty certain 70 would be well above average even for someone of perfect health and a more normal childhood back then. He must have been a tough old thing. Peter had obviously been abandoned before the age when he would have leaned to stand upright and walk. His skeletal system would therefore have developed very differently. Since it was reported he went about on all fours until he was about 10 years old, it would have been difficult to make him stand upright and walk. His musculature would have developed wrongly for the normal human upright stance and for walking. How he learned to do those things would have been a story in itself. Also, the fact of Peter’s early survival raises some questions. The human digestive system can’t process “grass and leaves”, which means he must have had other sources of nutrition. It’s reasonable to suppose he was suckled by an animal until he could feed himself. But what animal? If he developed hunting skills – and the fact that he was seen to like meat indicates that he was an omnivore – then he must have learned to hunt from another creature. But what kind of creature? And the last intriguing point is how he lived to a ripe old age. The stories that have come down to us of feral children usually end with them dying at relatively young ages. Their inability to adapt to human society, and the diseases they’re exposed to, usually resulted in early deaths. Peter was quite an exception. If only he were able to speak then we might know the answers to some of these questions. Peter was very much an exception; I would expect that his life-span was well above average in that era even for someone without his afflictions. Even if he was supported with his keep supported by the monarchy of the time, it is still a remarkable story.